Each assembly manuals are downloadable when there is internet connection. - Algorithm Object detection and motion control using IR Sensor value. 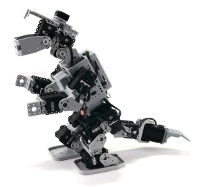 Place an obstacle in the robots path and turn the dinosaur robot on. When the obstacle disappears, it continues walking. When nothing is detected for a while, it will sleep. - Algorithm Motion control depending on the sound detection of the IR Sensor and Timer. 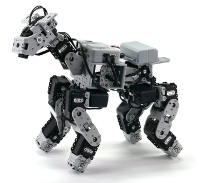 Place an obstacle in the robots path and turn the puppy robot on. When a sound is detected, it will walk avoiding obstacles. If you touch its mouth, it will do cute things. - Algorithm Application motion control depending on the sound detection of the IR Sensor and Timer. When it detects an object while walking, it will avoid it. It will attack when something is detected near the front. When an object is detected above it, it will crumple up its body. 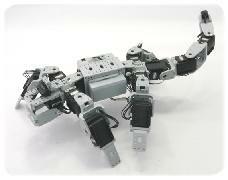 - Algorithm Application motion control depending on the number of sounds detected and DMS Sensor value. The robot sleeps when you first turn it on. The robot will awake when you clap. If you clap twice when the robot is awake, it will run away. The closer your hand gets to the sensor, the tail will rise to threaten you. 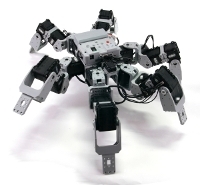 If you get too close, it will attack..
- Algorithm Obstacle avoidance motion control using the IR Sensor and DMS Sensor value. 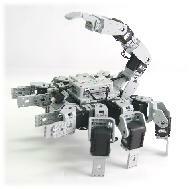 It will being crawling once turned on, and will stop when it detects an object then avoid it. When the tail is caught, it will try to escape.